I do not recognize my book in this review in the QLRS. As Rudolph Roth wrote over a century ago, "A translation must speak for itself. As a rule, it only requires a commentary where it is not directly convincing, and where the translator does not feel secure". "The technical proficiency of what he did with his voice, given his vocal range (he didn’t think his voice was good enough, back in the day), is often overlooked, the amount of time he spent in the studio just trying to get the right effect. Robert Fripp shares this story about watching Bowie in the studio, trying for hours to get his voice to match the emotion in the music. That’s complete artifice, complete inauthenticity, and yet he’s able to hit those feelings in a way no one else could. And what you feel when you hear that is something simply strong, powerfully true." The interview. 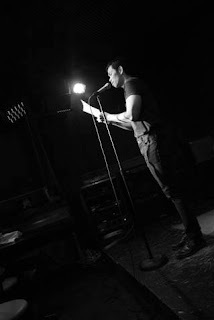 On Thursday night, I read from Steep Tea for The Inspired Word at Parkside Lounge, NYC. Thanks, Michael Geffner, for asking me to read and for taking these wonderful photos! On Sunday, I trotted along to Marc Straus Gallery for the opening reception for Jong Oh's show. The Korean artist creates sculptures that plays off the space and light of a site. "Tenuous strings and shards of Plexiglas are pulled into form by small stones or metal pendulums tied almost invisibly to the 21-foot high ceiling," as the gallery website puts it. The sculptures were mostly boxy, either backed by a wall or hanging freely in space. Most impressive was the last work. Two rectangles made of string are suspended one on top of the other. Due to their subtly shaded coloration, they looked like pieces of glass. Walking under them gave me a terrifically uneasy feeling. The show was curated by gallery director Ken Tan. "Steep Tea by Jee Leong Koh, a Singapore-born, New York-based poet, is a wonderfully rich and lyrical narrative on self-identity, diaspora and love. As the title fittingly suggests, the poems articulate the embrace of otherness and changes while traversing different cultures. Koh’s lyricism reveals influences from modern poets such as Elizabeth Bishop, Mary Oliver and Eavan Boland and Singaporean poet Lee Tzu Pheng; his poetry is full of music, originality and imagination...."
Yeo Wei Wei's "These Foolish Things"
Yeo Wei Wei sees the broken and hurting lives of her characters with a kind of dispassionate compassion. A wife finds her way home from mass devastation. An old woman in a home for the elderly. A blind painter. A female Math teacher abandoned by a younger lover. The subjects are ripe for sentimental depiction, but Yeo does not hurry to sympathize. Instead, with patience and care, she slowly delineates the details of their lives and the flush of their thoughts. The only exception, perhaps, is the story "The National Bird of Singapore," in which good and evil are too simply demarcated.